The Fellowship was fortunate enough to obtain a copy of FAMILY PETS from Silver Dragon Books. The story is by Pat Shand, art by Sarah Dill, and letters by Jim Campbell. Thomasina leads a rather lonely life. Her parents died on her fifth birthday, lives in the basement of her uncle and aunt’s house with her grandmother, and has no friends. All that matters is her pet snake Sebastian and Smitty, the boy whom she has a crush on. After making a simple wish, Thomasina’s life is turned upside down as Sebastian is now human and her family (except grandma Abuela) are now animals! What follows is an adventure that will take her to a magical world, and maybe a possible reunion along the way? Silver Dragon Books is the all-ages imprint of Zenescope Entertainment. The imprint doesn’t put out a lot of books, but it’s usually high quality material. FAMILY PETS is no exception. Pat Shand crafts (no pun intended) a nice little tale with the right combination of humor, adventure and drama and characters are very relatable. Sarah Dill’s art is simple, clean, yet effective and looks great. Highly recommended. 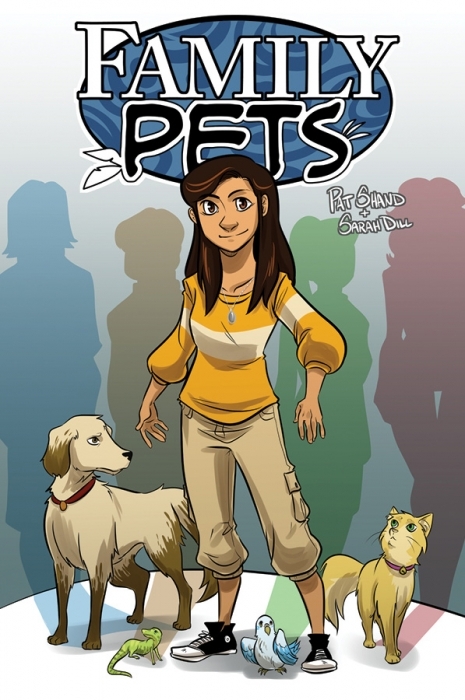 FAMILY PETS is in stores now, or available for ordering at www.silverdragonbooks.com.